The musical version of the 1992 movie will be performed at Cherry Hill West beginning on March 31. 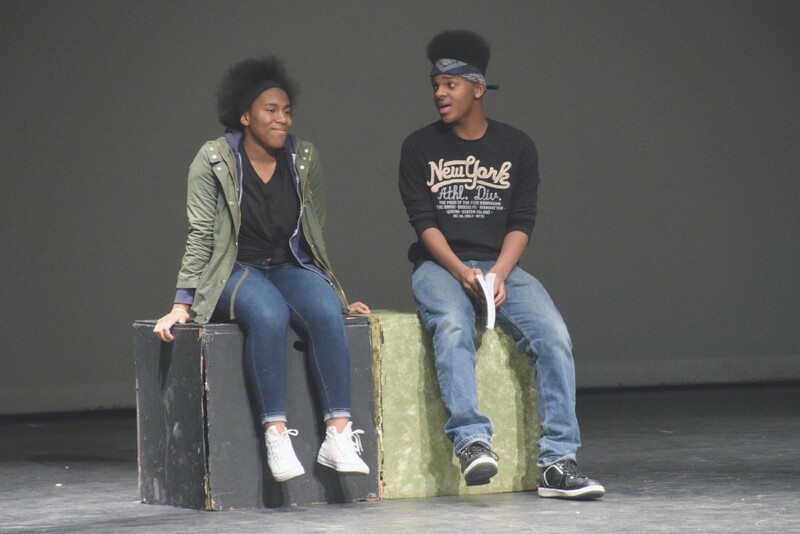 Junior Nyrobi Watson, playing the role of Deloris Van Cartier in Cherry Hill High School West’s spring musical, “Sister Act,” rehearses a scene with senior William Scott Bey, playing the role of Sweaty Eddie. “Sister Act” opens on March 31 and runs through April 8. If there’s one thing the cast of Cherry Hill High School West’s 2017 spring musical “Sister Act” can agree on, it’s how funny the show is. The cast hopes to provide a lot of laughs for the audience when “Sister Act” opens at Cherry Hill West. 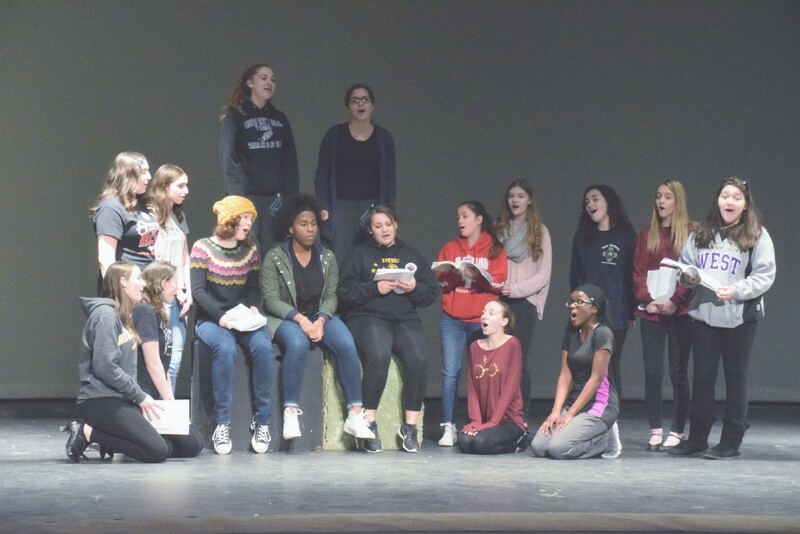 The Cherry Hill West Theater Department will put on six performances of the show, beginning March 31. “Sister Act” is based on the movie of the same name starring Whoopi Goldberg. In the show, the main character, Deloris Van Cartier, is sent to live with a group of nuns in a convent as part of being in a witness protection program. During her time there, Deloris helps revive the nuns’ choir, resulting in much-needed donations for the convent. Junior Nyrobi Watson is playing the lead role of Deloris. She is very familiar with the movie and was set on auditioning to be Deloris the moment she heard Cherry Hill West would perform the show. Watson feels she fits the role of Doloris very well, mostly because the character shares similar traits with her. Musical director Carolyn Messias said Watson has done a great job portraying Deloris during the auditions. “I think Nairobi especially having this image of Whoopi Goldberg in her head was helpful,” Messias said. There are a number of differences between the movie and the show. Deloris’ boyfriend is named Vince LaRocca in the movie. In the musical, his name is changed to Curtis Shank, though the character has the same personality as in the film. Students performing in Cherry Hill High School West’s spring musical, “Sister Act,” perform a song from the show’s second act during rehearsals on Monday night. Another big difference is the musical has a bit of local flavor. While the film is set mostly in San Francisco, the musical is set in Philadelphia. To add to the local feel, a surprise guest newscaster will be involved. The newscaster’s identity won’t be revealed prior to opening night. For the cast, the biggest challenge the musical presents is the dance numbers. There are more than a dozen students performing in the ensemble, and there are multiple large dance numbers in the show. “The dancing and the solos are a little bit tough,” said senior William Scott Bey, playing the role of Sweaty Eddie. Some students, such as Chance, have found the comedic parts of the show to be a bit challenging. The cast and crew are hoping fans of the movie will come see the musical. “Hopefully this will be something that people will bring their kids to see,” student director Sydney Kramer said. “Sister Act” will be performed March 31 through April 2, and April 7 and 8. Performances will be at 7 p.m. on March 31, April 1, 7 and 8. There will be 2 p.m. matinees on April 2 and 8. Tickets are $15 for adults and $10 for students and seniors. Seniors with a gold card can purchase seats for $5. To purchase tickets, call (856) 663–8006 ext. 1224 or visit www.showtix4u.com.